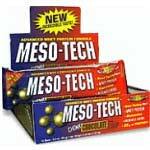 Muscletech Meso Tech Bar Review - MesoTech Protein Bar User Reviews. The unique formula of the MESO-TECH bar contains ingredients which have been shown to help bodybuilders and other athletes gain lean muscle mass while helping to support fat loss when combined with a diet and exercise plan. Muscletech Mesotech bar contains whey protein, which many experts consider to be the best protein for bodybuilders and other athletes. It also contains many other powerful nutrients, such as glutamine and branched-chain amino acids. The Meso tech bar is available in many delicious flavors! I buy 4 boxes of Muscletech's Meso-Tech each month, all in 1 flavor... Peanut Butter Chocolate. I use the bars as a post-work out meal (2-3 bars). This is one of the better tasting bars out there, even surpassing the Nitrotech line IMO. My habit goes back 4 or 5 years and maybe 20 pounds. All in all pretty good. Enough so I haven't changed my buying habits even with the opportunities discussed above.